We would be doing well to average 140 pounds this season. We are green and there isn't a passer or a kicker in the bunch, but we hope we will surprise many a spectator. 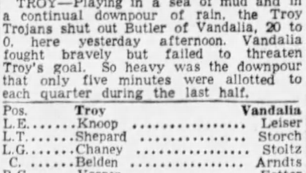 Coach Bob Driver may be best known in the Miami Valley as the namesake of the old Trotwood football stadium, but he certainly left his mark at Butler, delivering three championships over a two-year timespan in Vandalia. 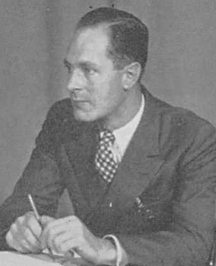 Driver became head coach for both the football and basketball teams in 1936. In 1937 he coached his teams to County League championships in both football and basketball. 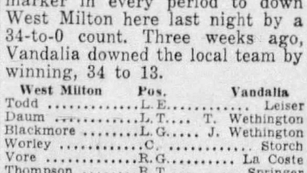 His basketball team would go on to also win the 1937 Montgomery County Tournament. This marked the first time that a team had ever won County League championships in both football and basketball. 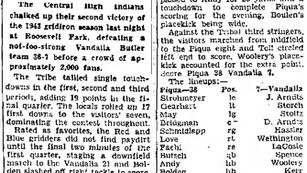 After the 1937 season, Driver was offered the head coaching position for Port Clinton High School for football and an assistant coaching position for basketball. He was replaced by first year coach Art Bussard. 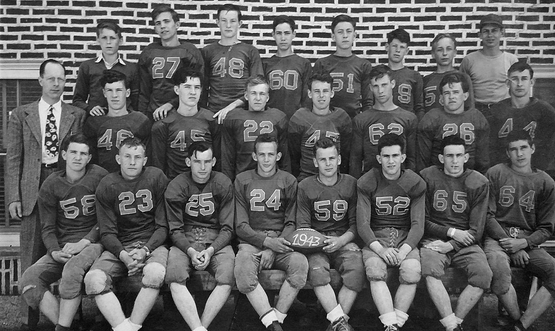 Driver coached at Port Clinton until he was drafted into the army in 1941. Driver served a year, but received a medical discharge and began working at Frigidaire in Dayton as a cost accountant. 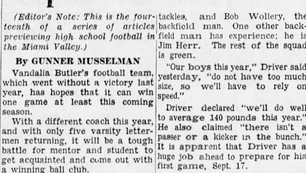 In February of 1943 Butler head coach Art Bussard was drafted. Worried over the prospects of having a coachless team, Superintendent M. Byron Morton reached out to Driver and brought the coach back home to Butler. 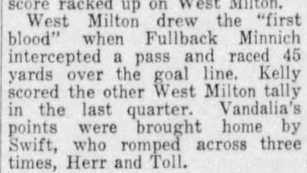 In spite of having a young team with few offensive weapons, Driver fielded a competitive 3-5-0 team in 1943, beating the Bulldogs of West Milton twice.